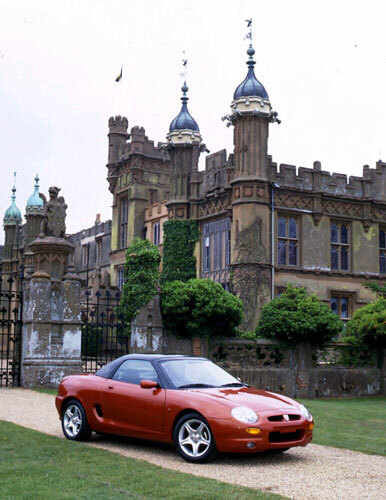 Introduced in 1995 to worldwide acclaim, the MGF car heralded the return of MG to volume two-seat sports car production that the marque vacated with the close of Abingdon in October 1980. It was created using novel design and a very considerable degree of ingenuity on the part of engineers whom with little or no budget from Rover management. What the car has achieved and its longevity is a testimony to the success of the work of those engineers. Initially available In September 1995 as just a single model with a 120ps 1796cc K series engine, the first use of a K series of this capacity, and then followed in early 1996 by the VVC (Variable Valve Control) version of the same engine that delivers 25ps more at higher rpm. Both models were only available with sports ratio 5 speed manual gearboxes, with a lower final drive ratio for the VVC version to match that engines higher rpm potential. The main innovation was the location of the engine behind the seats to create a mid-engined layout. This layout provides the optimum for weight balance and delivers excellent handling, and the MGF certainly has excellent handling. In addition the use of Hydragas (inert Nitrogen gas over fluid) suspension provides a quality ride, far in excess of that normally associated with precision handling sports cars. Surprising to most as this suspension is largely as fitted to the Metro. However, the brilliant handling and ride combination should not be a surprise when the earlier relation to Hydragas, Hydrolastic, is viewed in the original Minis and the competition and sales success these models had, especially the Cooper S in international rallying. Summer 1999 saw the first real facelift for MGF, which was mainly trim and equipment changes, but did see the introduction of the Stepspeed (then called Steptronic) CVT automatic gearbox with a manual option of six individually selectable ratios through steering wheel mounted buttons or the floor mounted gear lever. Unfortunately there is an approximate 15% loss of fuel economy with the auto gearbox compared to the manual. In spring 2001 the range was extended with a new entry level 1598cc 112ps and range topping but limited edition Trophy 160SE modified VVC version with 160 ps. Overall the MGF is a very economical range even with the higher consumption rate of the auto and this is often overlooked by potential purchasers. The 1.6 is the most fuel efficient and has an overall return of approximately 40mpg with the 1.8i coming in a little below this with around 38mpg. The VVC demonstrates the engines leap in overall efficiency and ability to have both added top end power and good lower rpm operation with an average of 37mpg. These figures are all compared with using like testing conditions to provide a realistic comparison. Real driving conditions vary as does driving style so results will vary from these, lower for just urban use and higher for mainly distance cruising. Indeed many owners will see mid 40’s on manual cars in these conditions. The extension to the model range were obvious and needed, but severely restricted during the BMW period of ownership, 1994 to 2000, so that the MGF did not create any greater competition to the BMW Z3 two seat sports car. The belated additions were well received and provided the stepping stone to MGF 2, which was launched in January 2002 as the MG TF. 0 to 60 mph 9.7 secs to 6.9 secs.